Many tourists think that Fisherman's Wharf in San Francisco is a must-see, but ask any local what they think about it, and you’ll likely get a different answer. That’s because Fisherman's Wharf is not representative of the San Francisco that locals know and love. It’s considered by most who live here to be a tourist trap, with inflated prices, large crowds, expensive parking and lots of stores selling kitschy trinkets. That, and most of the food offered is not much to write home about, which is a shame in a city that has so many fantastic dining options. Since this is a site that aims to get you closer to the more authentic experiences of San Francisco, it's hard for me to enthusiastically endorse spending much time here. That said, there are many people who enjoy it. Most of my family members from Europe love to come here when they are visiting from out of town, and there is a lot of entertainment for children. The location by the water is lovely. There are charming views of fishing boats, as well as the Golden Gate and Bay Bridges, Angel Island and Alcatraz. Several tours leave from Fisherman's Wharf: such as bus tours, bike tours, Segway tours, as well as ferry rides on the bay, or boat trips to Alcatraz. There are several bike rental shops to help you plan independent sight-seeing trips (such as a trip across the bridge - something I would totally recommend), and they come complete with safety gear, maps, and directions on how to make your way around the city. There are many souvenir shops if you are looking specifically for San Francisco memorabilia, such as San Francisco mugs, T-shirts, and shot glasses. The sea lions at Pier 39 are probably the best attraction in all of Fisherman's Wharf, so if you are there, definitely check them out. With hundreds of them hanging out on Dock K, it’s a great opportunity to take a close-up look at these big bellied beasts. Know Before You Go: Their numbers fluctuate throughout the year, and during the summer there are not as many hanging around. They migrate south to breed, and return at the end of the season. The Musée Mécanique is an amusing and free stop to check out a privately-owned collection of antique mechanical jukeboxes, musical instruments, slot machines, fortune-tellers and picture boxes. Try Boudin’s famous soup in a sourdough bread-bowl. It’s a fun idea, the bread is good, and it is one of the more reasonably priced meals that you can get there. Many little stands along the wharf sell clam chowder, but Boudin’s Bakery offers additional choices of tomato soup or beef chili. The clam chowder is definitely the most popular, but I think the chili is the tastiest. Fisherman's Wharf is really the only place in the city with regular street entertainers. Watch out for the bush man! When you get tired of the crowds, you can get some rest at the nearby Aquatic Park, a relaxing setting, distanced from the crowds, to watch boats sail by in the bay. Since it is located next to the Dolphin Club, you may even see some brave, local crazies entering the chilly bay water for a dip. Last, you can cap off your afternoon with a stop at the Buena Vista for an Irish Coffee, before heading to the nearby, world-class Gary Danko's ($$$$) for dinner. Check out my page on best restaurants in San Francisco for more suggestions of places to eat! Muni lines 8X and 8BX (peak hours only), 19, 39, 47 and the historic F Market Street car will get you closer to the east end of Fisherman's Wharf, closer to Pier 39. Muni Lines 19, 30, 47, 49 and the Powell-Hyde cable car will get you closer to the west end of Fisherman's Wharf. The Powell-Mason cable car drops you off roughly in between. For a map of the muni system, click here. If you are staying downtown, have a good amount of time to explore, and don't mind a healthy dose of walking, you could explore the Chinatown and North Beach neighborhoods on your way to Fisherman's Wharf. Start at the Chinatown Gate (Bush and Grant) and continue north on Grant Street. When you reach Columbus Street, make a left and walk the length of it to experience the North Beach neighborhood. 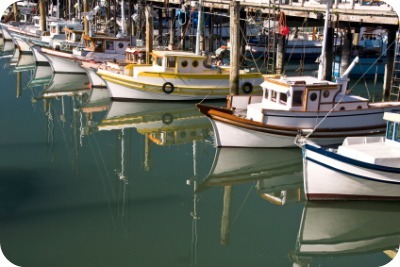 At the end of Columbus you will find yourself at the west end of Fisherman's Wharf, near the Cannery and SF Maritime Historical National Park. Street parking around the Wharf is limited, and non-metered spots are permit-parking only. The meters are good for just half-hour and one-hour time limits, so your best bet is one of the several, nearby parking garages. You pay $15 or more for a day, and the daily maximum is usually reached within the first 2-3 hours. For discounts to attractions at the wharf and around the city, you can purchase a CityPASS, a Go SF Card, or a Wharf Pass. For example, although the Wharf Pass allows you access to 6 choices of tours and attractions, it's only valid for 2 days. You have to be a tireless and well-organized traveler to really fit everything in. It also offers a 2-hour bike rental, or a 1/2-hour GoCar rental, neither of which is enough time (in my humble opinion) to really get worthwhile use out of them. If you are a member of AAA, check out their website for discount coupons to San Francisco attractions, such as the SF Zoo, the Asian Art Museum, California Academy of Sciences, bay cruises and whale watching tours, as well as discounts to restaurants, hotels, and rental car services. Interested in tasting delicious seafood? Bar Crudo in the Western Addition has an amazing seafood menu. 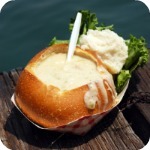 Their clam chowder will blow the Wharf chowder out of the water any day. Granted, it’s a different caliber of food altogether, but if flavor is what you are after, than this is the place to try. There is also Pesce, a seafood restaurant in nearby Russian Hill. To get there you can take the Hyde St. cable car, hop off at Hyde and Green, and then walk 2 blocks down to Polk Street. If you love oysters, the Hog Island Oyster Company at the Ferry Building offers great, local selections. Looking for a place to enjoy San Francisco's amazing scenery? A stroll along the beach at Crissy Field, a venture to SF's off-the-beaten-path attraction, the wave organ, or a visit to the Sutro Baths ruins can provide similarly fantastic views, but in a less tourist-heavy setting. 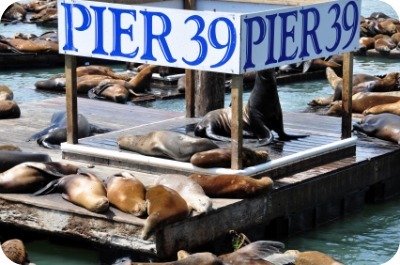 As I mentioned before, the best part about Fisherman's Wharf are the sea lions, and Pier 39 is where they are located. The rest of Pier 39 is essentially an outdoor mall with a variety of shops and places to eat. As I have said elsewhere, I would recommend other places in San Francisco for shopping and dining more than anywhere on the Wharf, however, they do have some unique and quirky shops - such as a store dedicated entirely to puppets. This is another popular tourist destination, and it's not too hard to understand why. Who doesn't love chocolate? It's the original manufacturing location of the Ghirardelli Chocolate Company, and when you visit their store you can still see the original chocolate making equipment being used. There are also some other charming places there, such as the Crown and Crumpet where you can sit down for high tea, Kara's Cupcakes - an artisanal bakery, and the Wattle Creek Winery's Tasting Room. Made in Italy, and hand painted with scenes from around San Francisco, the carousel at Fisherman's Wharf is the only carousel to have imagery of its home location depicted on it. Riding the carousel once is $3/person. What's cool about this place is that it's been a family-run business for over 45 years, and one of the sons has actually designed and sculpted some of the wax scenes and figures himself. There are replications of Brangelina, Marilyn Monroe, and Britney Spears for example, but the most impressive is the representation of The Last Supper. Although it's somewhat interesting, it wouldn't be my first pick for a museum, especially if you only have time for one. It falls into the general category of cheesy things at Fisherman's Wharf, and that's not the type of place I would want to explore if I were visiting a city elsewhere. This is my subjective opinion of course, if you are still curious you can find out more about it here. Located on Pier 39, one of the coolest things about visiting this aquarium is the underwater tunnel that you walk through. A jellyfish exhibit in the beginning is pretty, and on the top floor there is a petting area where you can touch star fish and sting rays. It's a small location though, and if you really, really want to go to an aquarium, and you would be up for a scenic day-trip out of the city, the Monterey Bay Aquarium is much better. A museum that dedicates itself to the bizarre - this is a place who honors a man (Mr. Robert Ripley) who was an artist, an adventurer, quirky and unconventional. As such, he embodied the spirit of many a San Franciscan. That said, I think I like this place more in concept than actuality. It can be a good place to bring kids, although you definitely get more out of the experience from reading the captions about the displays, which younger kids may not want to do. The Maritime Museum is housed in a lovely old bathhouse from 1939, but is actually closed now for a several-year renovation. It can be worth a look from the outside if you are nearby, or you can use it as an excuse to escape from the crowd, as it is located a distance from the often chaotic hustle and bustle of Fisherman's Wharf. The Cannery, which used to be a fruit and vegetable canning plant for several decades, was first built in 1907. It received a face-lift a few years ago after a nearby fire caused some external damage to the building, and today it is an attractive, red-brick shopping center with a few stores and restaurants. There is a nice courtyard in the center with outdoor seating, and they have regular farmer's markets and musical entertainment there. It's not much to see unless there is an event here, but the history is interesting. This is where the infamous Trips Festival was held in 1966, a weekend long Acid Test party, back when LSD was still legal. It was inspired by Stewart Brand and The Pranksters, and put on with the help of Ramon Sender, Ken Kesey and Bill Graham. The Grateful Dead, as well as Big Brother and the Holding Company performed at the party to help people "turn on, tune in and drop out".